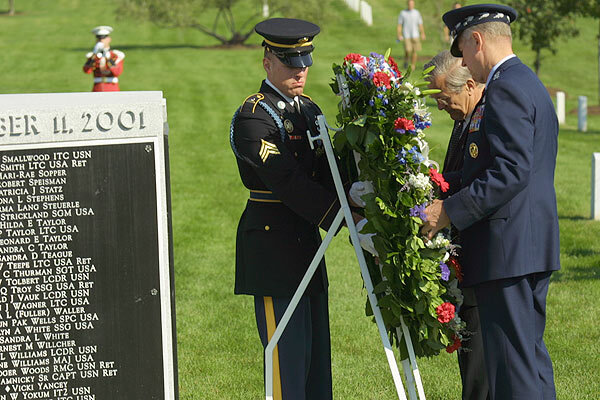 Secretary of Defense Donald Rumsfeld (without hat), and the Chairman of the Joint Chiefs of Staff, General Richard Myers (right) place a wreath at the memorial for the victims of the attack on the Pentagon at Arlington National Cemetery. September 11, 2003 - Secretary of Defense Donald Rumsfeld (without hat), and the Chairman of the Joint Chiefs of Staff, General Richard Myers (right) place a wreath at the memorial for the victims of the attack on the Pentagon at Arlington National Cemetery. Today is the 2 year anniversary of the single worst terrorist attack in history.